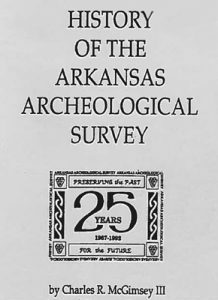 The Arkansas Archeological Survey (ARAS) celebrated its 25th anniversary in 1992. 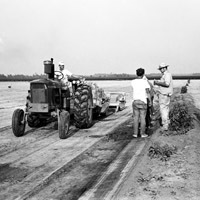 Among the events associated with that celebration was publication of a 78-page booklet on the History of the Arkansas Archeological Survey, written by Charles R. McGimsey III and Hester A. Davis. 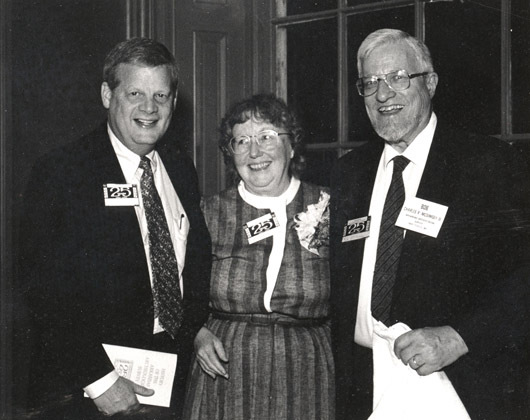 Dr. B. Alan Sugg (left), then President of the University of Arkansas System, with Hester Davis and Bob McGimsey at the 25th Anniversary celebration in 1992. In Part II, Hester picks up the narrative to recount the Survey’s formative years. It was no small task to grow ARAS to its present composition. At the beginning, the organization consisted of a Coordinating Office with a small handful of people plus three one-person research stations (to which secretaries eventually were added). Lots of events, lots of experiences gained, lots of valuable accomplishments made, and more than a few lessons were learned along the way. Hester’s account is an amusing read, but insightful as well. 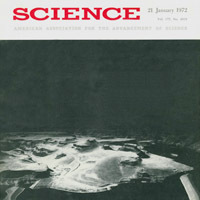 Long out of print, on the occasion of our 50th anniversary we are making this History available again, this time in the form of a downloadable PDF. That nobody possessed the fortitude to write a 50th anniversary history of ARAS stands as testament to Bob’s and Hester’s tenacity in celebrating the legacy of their accomplishments during the Survey’s early years. 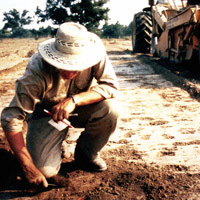 1992 History of the Arkansas Archeological Survey. 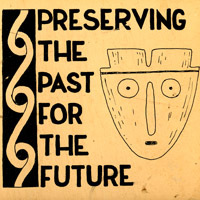 Arkansas Archeological Survey Special Publication, Fayetteville.